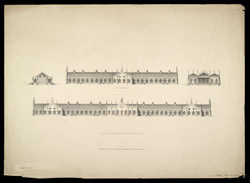 Engraving of the front and side elevations of the Jamsetjee Jeejeebhoy Hospital in Bombay by an unknown engraver c.1842. Jamsetjee Jeejeebhoy Hospital was built in the 1840s and was funded jointly by Jamsetjee Jeejeebhoy (1783-1859), the Parsi merchant and eminent philanthropist, and the East India Company. This architectural engraving shows that the hospital was intended as a long single-storey building in the gothic style.